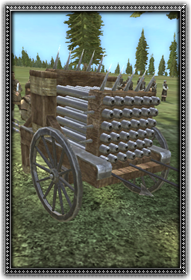 Italian inventors have been experimenting with mounting large numbers of gun barrels in one frame. This example features 36 mounted on a wagon much like the standard ribault. It is capable of firing in 6 shot volleys or a titanic 36 shot barrage, thus truly deserving the title of monster.